Simple but absolutely functional – that sums up the Altra Stanley Deluxe Parsons Desk. The simplicity is what really sets this desk apart from the rest. It has an ample amount of surface for your laptop, as well as shelves underneath for the rest of your work paraphernalia. This Parsons desk is so thoughtfully designed that you’ll love to work sitting in front of it. The Altra Stanley Deluxe Parsons Desk functions perfectly as a home office desk. The smooth, spacious, and flat surface allow for you to work with ease. 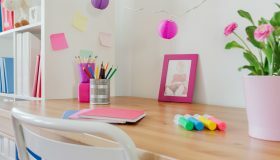 You will have enough room to place your laptop and other desk décor or paraphernalia. The 2 storage units on either side is a perfect addition to the desk. It allows you to place your binders, documents, or books you need for work or leisure within easy reach. 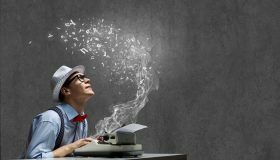 Since it is an open-style shelving, you don’t need to spend a second more just to get to the document or book you need to retrieve. The size of the shelves also allow you to store just enough things on it to keep your surface as clutter-free as possible. 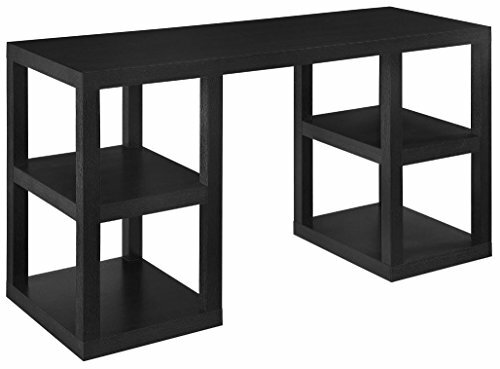 It comes in a black oak design which really adds to the style and professional look of the desk. It blends in well in any home interior. The dimensions are also just right so that you won’t be taking up too much space in your home office or den. If you’re concerned about leg room, don’t be. The table has enough space for you to stretch and move your legs without feeling like you’re going to cramp an hour into your work. When paired with the right chair, your chair can even fit right in through the table so that you won’t have to worry about your chair jutting out when not in use. The materials used are hollow so the table is surprisingly lightweight. The assembly of the table is also quite easy and can be done quickly. The table height may be too high for some. 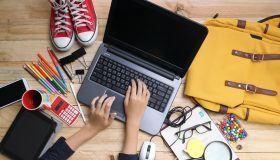 Measuring 33” from the floor to the top of the desk, shorter people may have trouble using the desk unless they have a chair that can give considerable and supportive lift. 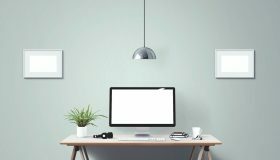 Check out this article to find out the correct desk height for you. In order for the table to be sturdy and hold in place well, the shelves have to be properly installed. 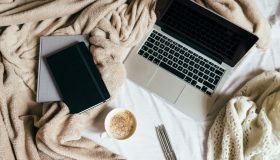 If you want to forego the installation of the shelves, you might experience a wobbly desk that might feel unsupported at times. If you want to place your tower or your printer in the shelves, you may have some difficulty depending on the size of these items that you carry. However, the desk is sturdy enough to support a printer being placed on top of the desk. You can also adjust the shelves lower if you want the option of placing your tower within the shelving space. The look, the size, and the feel of the table all in all helps to give it a 5 out of 5 rating. 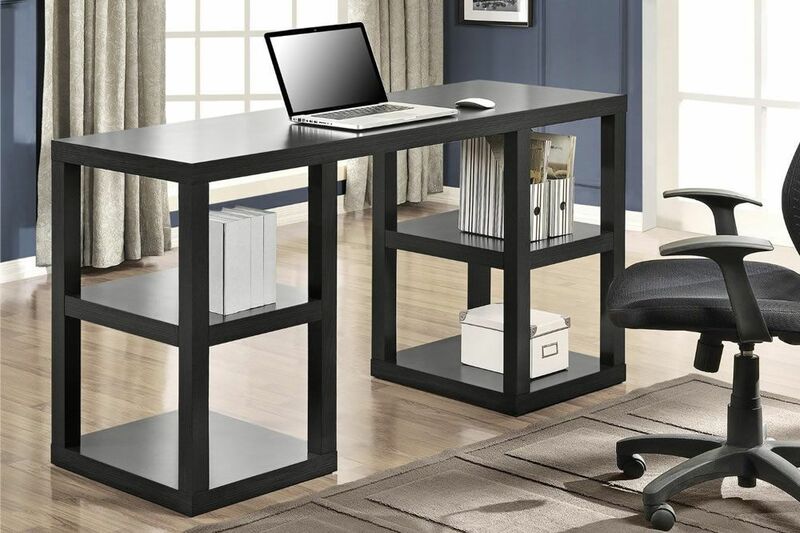 You won’t go wrong with the Altra Stanley Deluxe Parsons Desk, Black Oak especially if you use it for home office use. Altra also has another desk called the Altra Parsons Study Desk with Drawer, Black Finish. This is considerably more affordable than the Altra Stanley Deluxe Parsons Desk. However, even though it comes with a drawer, it doesn’t come with spacious shelves like the Atlra Stanley Deluxe. The Altra Parsons Study Desk with Drawer is great for a study desk, but not as recommended for home office use. 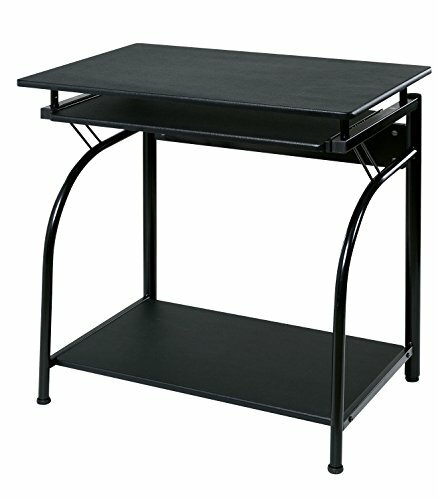 You may also be interested in the HomCom Small Home Office/Dorm Computer Desk – Black. 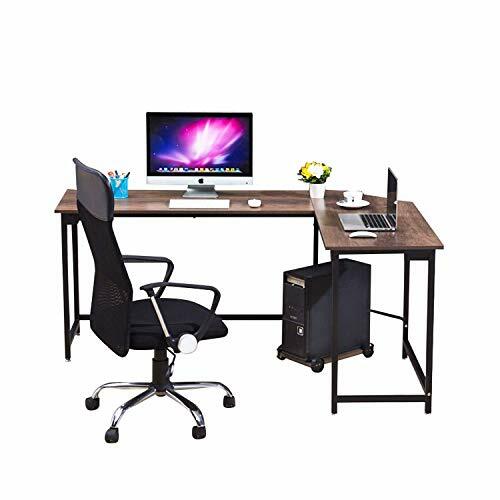 This is more expensive than the Altra Stanley Deluxe Parsons Desk but it comes in a compact size, has a pull out keyboard tray, storage options for documents, and a compartment to allow storage for your computer tower. However, it does give off the look like it’s a table fit for a student rather than a working adult. If you love the appearance and the professional feel of the desk, the Altra Stanley Deluxe Parsons Desk is a good choice for you.